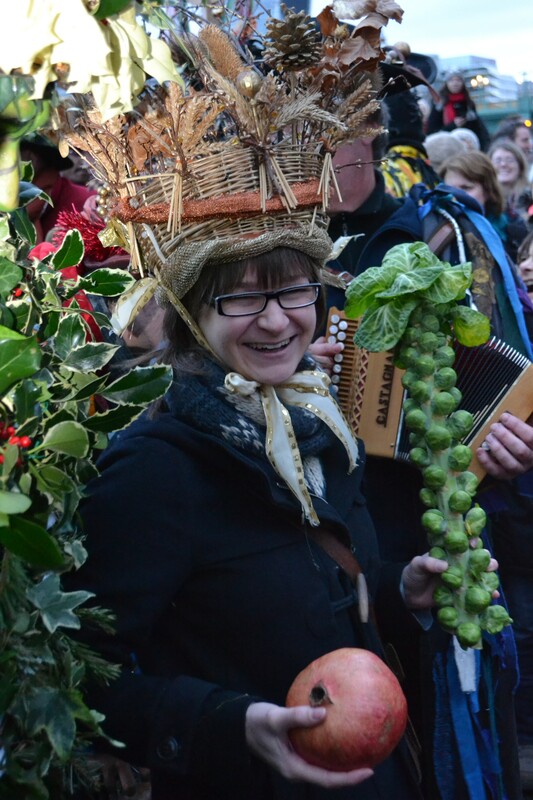 Wassailing appears to be all the rage in folk circles with revivals occurring all over. I had planned to discuss another custom for January, but after travelling back from Australia for Christmas and as I was in London, I decided to see this event and became so entranced by it that I felt I needed to extol its virtues. Appropriately for someone coming from overseas, Bankside is a sort a microcosm of the modern day Britain. Old terraces share their boundaries with a resurrected Elizabethan Theatre, The Globe, whilst the shell of a monstrous power station holds a bizarre collection of art nearby. All lay along a mighty river. Quintessentially Britain in a nutshell. So it seems appropriate to establish a folk custom here which distils a number into one event! Mark Rylance, artistic director of the Globe was apparently the inspiration for this enterprise. A group, The Lions Part, being a spin of the Original Shakespeare Company based at the Globe, established the event in 1994 and it has gone from strength to strength since. For many there, this may be the first and only encounter with British folk customs and so the Lions Part have a large responsibility placed upon their shoulders. I did feel considering the enormous numbers watching the Mummer’s play, that someone should have been leafleting for mummers play countrywide…Like this? Why not try a Plough Monday play? 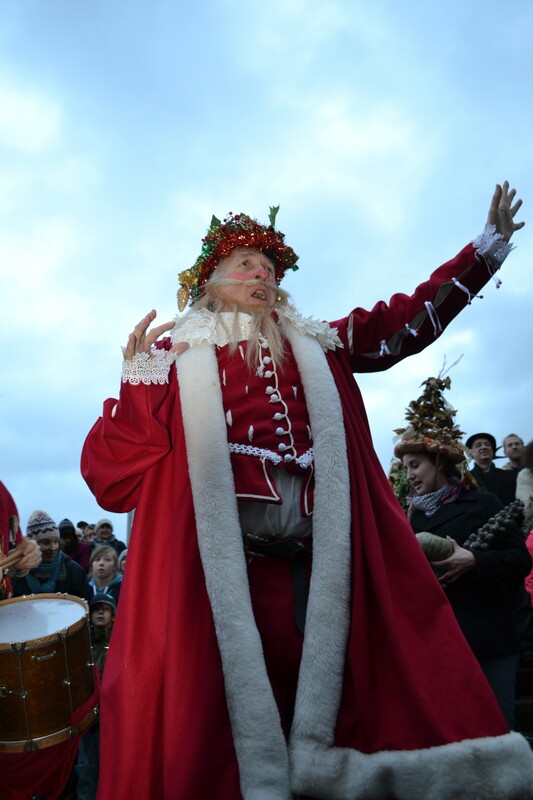 Despite the contrived nature of the custom, this is a custom which works…many because of the enthusiasm and professionalism of the performers but also because it is a curious amalgam of great British customs…a Green Man, Wassailing, Mummer’s Play, Molly dancing, Father Christmas, Twelfth Night cakes and the Lord and Lady of Misrule and even a tree dressing. Nothing was missed to make this smorgasbord of customs. The arrival of the Holly Man despite the modern panorama before us still has an ancient evocative appeal. Rowed by an old Thames Cutter, his image comes closer to view. To a number of people watching on the embankment, this must have been a very bizarre sight and not one they thought they may have encountered as they checked out Tate Modern! On the steps awaited Beelzebub carrying two flaming torches, a stag and a white bear (based on the Polar bear of the medieval Tower). The Holly Man is a fine if possibly rather uncomfortable sight! 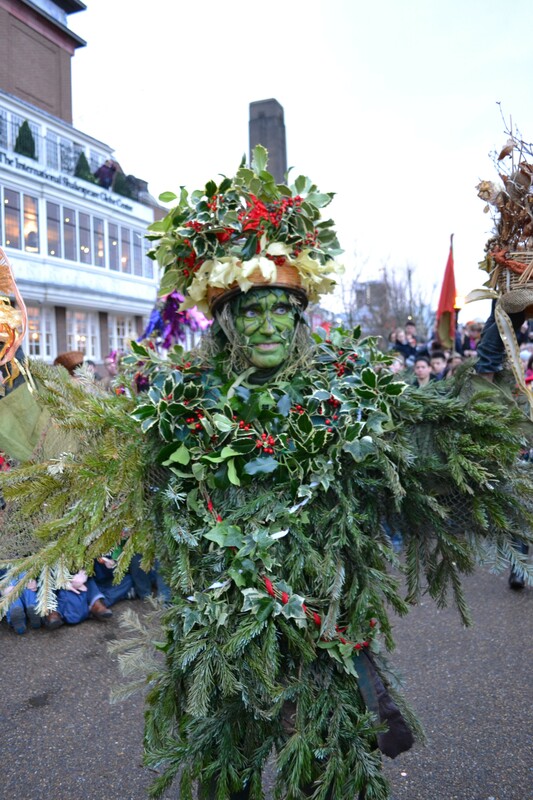 Impressively covered head to toe in a variety of holly, ivy and yew, his face painted green with tendrils and leaves applied overall very otherworldly. Potentially the Holly Man looks very scary indeed but fortunately David Ridley who play him, spends a lot of time smiling. 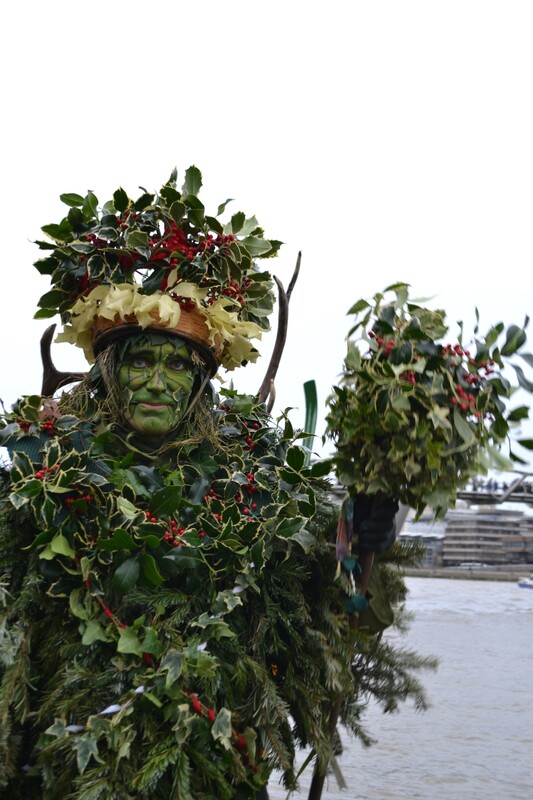 The Holly Man is a curious character in folklore, identified by Robert Graves in The White Goddess as the Holly King who represented one half of the year being at his strongest at the Midwinter period and weakest naturally at Midsummer, when the Oak King ruled. Whilst as an archetype it is an obvious model, there is no evidence that such a figure existed in England, although he is clearly popular with Neopagans. And it Wassail from him and Wassail from me! The group then moved with their swarming crowd to an arena nearby for their mummer’s play. The characters of this play ranged from those still in circulation in the ‘modern’ mummers – St. George, Turkish Knight, Father Christmas, Beelzebub and the Doctor. To this they added Prudence, Gill Finney, Cleverlegs and Twelfth Bake, some of which have an authentic Elizabethan flavour. The play, which was certainly longer than your average Mummer’s performance had all the usual ingredients, conflict between St. George and Turkish Knight, his death and resurrection at the hand of the Doctor with various add on scenes. The play was without doubt the slickest and best mummer’s play I had seen. That is no slight upon the many extremely enjoyable amateur performances, but of course, when professionals are involved like the theatre the result can be excellent. The best performance was by Justin Brett who played Beelzebub, he easily embodied the mischief and devilish nature of the character….very much like a court jester, and indeed he reminded me of Timothy Claypole of BBC TV classic show Rentaghost. He was very amusing and played the crowd excellently during a section where he cried out for topics from 2013 to create rhymes…although I worried I had gone through a time worm hole when someone shouted ‘Olympics’. Certainly amongst the topics such as flooding, a rhyme about the death of Margaret Thatcher was well pitched to the clientele of Southwark and ‘arty’ establishment who were not exactly big supporters of the Iron Lady…it engendered the biggest laughs let us say! After the Mummer’s play, cakes are distributed for the crowning of the King Bean and Queen Pea. 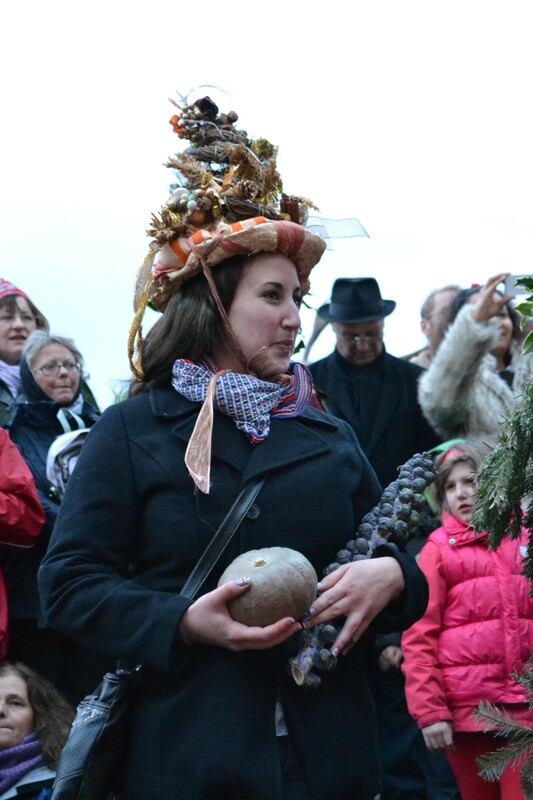 Twelfth Night is an event that now has only become synonymous with taking the decorations down, (see a forthcoming February post for comment on this), but from medieval times to early 1800s it was a time to celebrate often with feasts and fun. Often the day would be associated with a Lord of Misrule character that would overturn the usual master and servant relationship. As time went on, many of the traditions associated with it died out…the cake lasting the longest before being brought back to Christmas Day itself. Yet despite its apparent demise it is interesting to see that you can’t keep an old custom down! This custom appears to have been popular in Tudor times having been imported from France or Spain, the finder of the bean would be the King and the pea the Queen As a custom it died out in the 1700s I believe and so again it was great to see the group revive it. However, this year there was some problem finding the pea I believe, someone must have swallowed it unbeknownst and so someone volunteered to be the King Bean. So the King and Queen, both women. After this we travelled to the George Inn, Southwark. The curious assemble of onlookers, now becoming entranced by the whole spectacle gladly held hands and made their way to the watering hole in a giant unbroken daisy chain. Once at the pub, the Holly Man with his Bean and Pea royalty read their third Wassail. The group promised storytelling and dancing. I stayed for the dancing, Molly dancing from East Anglia, just to collect the folk collage. What is curious is that the Bankside Twelfth Night, despite its twenty year vintage has soon become a focus for modern pagans. Like a modern day fertility symbol, there appeared to be no shortage of young women wishing to pose with the Holly Man, again underlining our need in this modern world for a fertility symbol. Perhaps for many here the surrealist day they might experience…especially for me with my day starting with a cup of tea with Noel Gallagher sitting beside me in Tate Modern. Rock stars. Modern Art. Holly Man…it’s difficult to work out what is more surreal!